I became suspicious a few days ago of the alacrity with which the ABC and Fairfax media were covering the ‘people’s revolution’ in Egypt. These people in Cairo were demonstrating for democracy against an implacable tyrant and friend of America; surely, an irresistable magnet of radicalism and ‘activism’ for our Left. To help explain this unseemly excitement in the tumescent voices of ABC announcers, along comes David Burchell. [W]hen the crowds sprang up like lilies on the streets of Tunis, Cairo and Alexandria last week, our eyes lit up with undimmed optimism as we raptly observed – for the hundredth time, surely – the sovereignty of the people asserting itself and driving out a dictatorship whose existence had been a matter of scant interest to most of us merely a few days before. What could be more joyous than to witness the inchoate majesty of the people displayed on somebody else’s streets, at no possible cost to ourselves? Observe the delighted, childlike rapture of the commentators. In a brilliant piece by Bret Stephens, a deputy editor of the Wall Street Journal and reprinted in The Australian, there is a view that is only gradually beginning to be expressed, an opinion that would be difficult for many in our media to even begin to grasp. Stephens wants you to imagine yourself as Hosni Mubarak, master of Egypt for nearly 30 years. You’re old, unwell, detested and addicted to power. But you haven’t just been listening to the demonstrators. You’ve also been watching them—the way they dress, the way they shave. 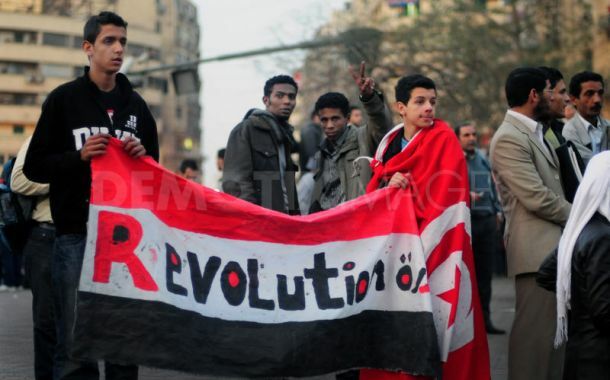 On Sunday, in Tahrir Square, you could tell right away that most were from the Muslim Brotherhood, though they were taking care not to chant the usual Islamic slogans. And Western liberals want you to relinquish power to them? So you see, without even trying — or perhaps realizing it — the ABC has been getting excited by a revolution with “activists” that will precipitate another Islamic revolution, this time with the despised Muslim Brotherhood. It must be instinctive with these people. This entry was posted on February 2, 2011 at 02:57 and is filed under Uncategorized. You can follow any responses to this entry through the RSS 2.0 feed. Both comments and pings are currently closed.